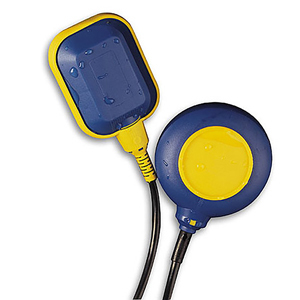 The LV600 Series unique float level switches provide an economical means of pump-up/pump-down level control with just one level switch. The ON/OFF differential is set by adjusting the length of cable over which the LV600 is allowed to float. Depending on whether the LV600 is floating with the cable UP or DOWN (see drawing), the 15 amp relay is on or off. The relay changes state when the LV600 is above or below the fixed point by 80% of the cable length. For example, if the cable is fixed for 10' (3 m) of free cable, the LV600 will trigger at 8' (2.5 m) above and below the fixed point. Thus, turbulence will generally not cause false switching. The cable can be fixed to a pipe, or the accessory counterweight can be used by slipping it over the cable (see drawing). The mechanical SPDT switch has no potentially dangerous mercury, is rated for 15A at 250 Vac, and can switch more than 100,000 times. The internal microswitch relay carries UL and CSA approvals. The case and cable are hermetically sealed by a two-step plastic injection molding process to ensure a leak-tight seal.